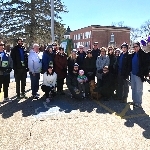 We here at Monaghan Leahy are proud to sponsor Mary's Walk in honor of our colleague Matt Libby's mom, Mary Kerry Libby. Matt and his beautiful family, including wife Kelsey and daughters Tess and Caroline, are integral parts of the Monaghan Leahy family. Matt, Kelsey and family live in Saco next door to the home where Mary raised Matt and his 3 sisters. Tess and Caroline are happily surrounded by many Kerry/Libby family members including aunts, uncles and cousins which must surely make Mary very happy. Matt came to Monaghan Leahy several years ago and has distinguished himself as a trial lawyer. He has been recognized by his peers several years running for his excellent legal skills. It did not take long for Matt to inspire the rest of the firm to engage in Mary's Walk. It has become one of our best enjoyed annual traditions! Anything you can do to help fight this dreadful disease is greatly appreciated. Your contribution will be put to work funding Maine-based programs focused on cancer prevention, early detection, improving patient care and researching the causes & cures of this terrible disease.